pesto | real food. home made. This is a fantastic quick, simple recipe to have in your arsenal. In a pinch, grab some sausage and brussels sprouts on your way home from work and you can have a delicious dinner on the table in no time. I almost always have pesto, parmesan, garlic and a variety of whole wheat pastas in stock at home. One time, the store had no brussels sprouts, so I roasted up some zucchini “coins” instead. That was okay, but nothing like the brussels sprouts. Slice brussels sprouts, and add them to a bowl with 2 T EVOO and the salt and pepper. Mix gently and spread them out on a baking sheet lined with aluminum foil. Bake for about 30 minutes, or until sprouts are tender and crispys are crispy. Cook your pasta according to package directions while slicing your garlic and sausage links. 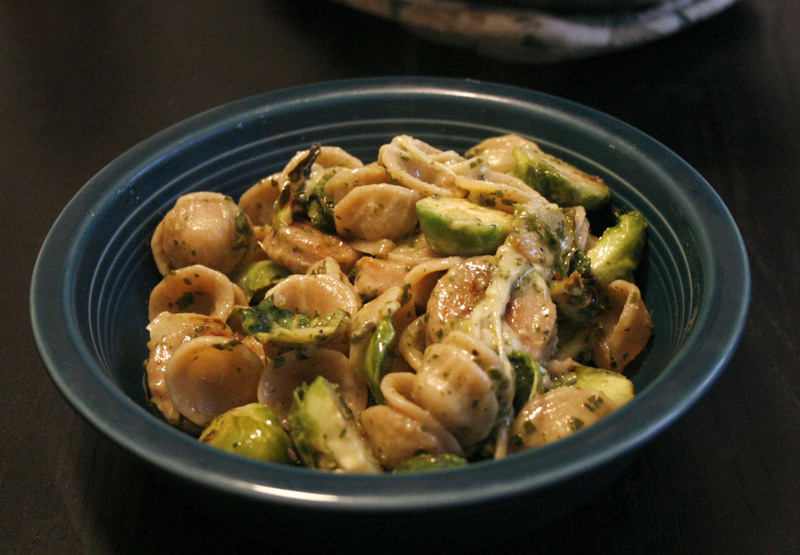 When pasta is cooked, add it to a large bowl with the pesto, parmesan, and the finished brussels sprouts. In a large skillet, heat 1 T of olive oil over medium-high heat and cook your sausage links until they are browned. During the last minute of cooking, add in the garlic. Add your garlic and sausage to the bowl with the rest of the ingredients, stir together, and then serve!